when I checked for a possible upgrade a while ago (2016-06-13 11.00.17 to be specific) I was able to find an upgrade path from 1password 3 to 1password 6 for Mac. Since then I was just using the trial version of 6, but now I would wanna upgrade. I was only able to find the standalone offer for the full price though. 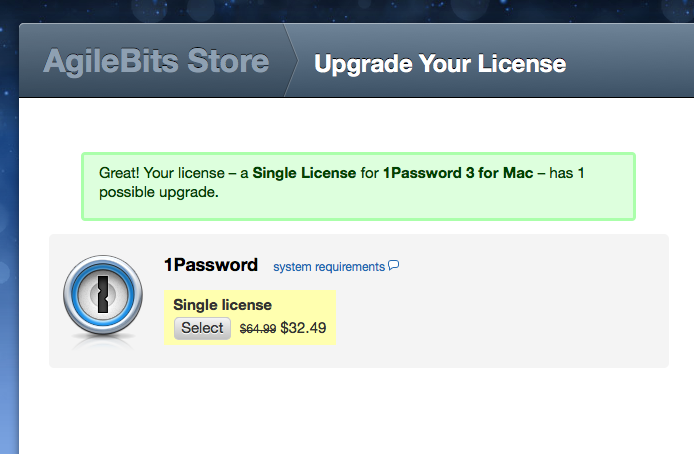 Where can I enter my previous license key to get the discount - or is this discontinued for some funny reason? If you'd like to discuss other purchasing options or your specific case please send us an email to [email protected] so we can discuss your particular situation more directly. Email sent, the membership model is not an option for me. The benefits are needless in my case and recurring billing is not possible for accounting reasons. I like the software as is and don't need permanent updates. If needed, I would buy an upgrade for a one time fee if I do see enough benefits of a new version eventually. Thanks, @timosen. One of us will be in touch in reply to your email soon.